Been working on some shots for a trailer/preview for the Ajax project. Since the pilot episode features the Gorn, TPTB wanted a Gorn Battlecruiser for the teaser ( I don't think that is too much of a spoiler since a lot of the behind the scenes material for Ajax has been showing some of the Gorn props). 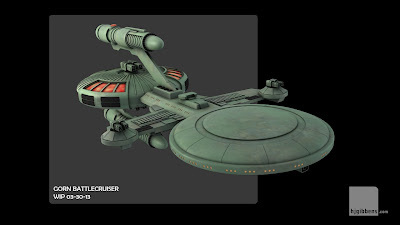 Now, the Gorn ships were never actually shown in the original TOS episode in which they first appeared - "Arena", although a new CG ship was created for the Remastered version of the episode. 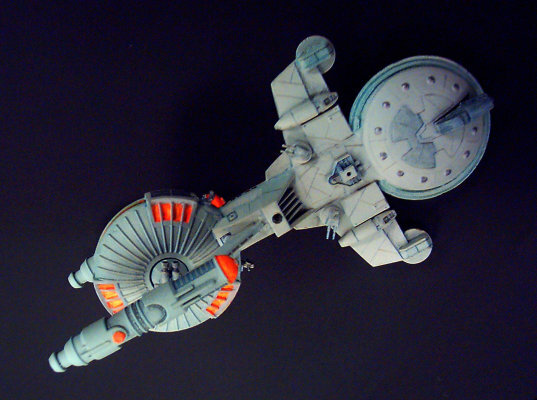 However, the Gorn ships were featured in the miniatures line for Star Fleet Battles, which owes some of its stylistic influence to the FJ Technical Manual. Dilemma time - which version do I go for. The SFB versions were a little bland, but were iconic with 'fans of a certain age' - however, in my internet travels, I had come across pictures of an SFB Gorn miniature which someone had upgraded and detailed. This served as my basis for the design. 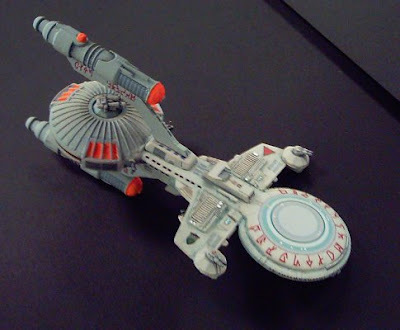 Unfortunately I do not have the name of the original modeler, but please consider them duly credited. I've kept most of the original detailing, beefed up the weapon emplacements and replaced the nacelle bussards to differentiate them from the Federation design. Since it is based off the SFB configuration, I should be able to produce some of the other designs using some of the parts that I have already built. And here is a compilation of some of the footage from the teaser. Some are upgrades of the shots from the previous test footage - better texturing and compositing, little touches like the moving stars seen in the TOS footage, while others are new shots. Still not quite there yet with the texturing on the Ajax - it's pushing too much into a silver grey rather than the grey blue that we are used to seeing in the original 60's footage - more tweaks to come. Compilation from Henry Gibbens on Vimeo. Excellent work Henry. 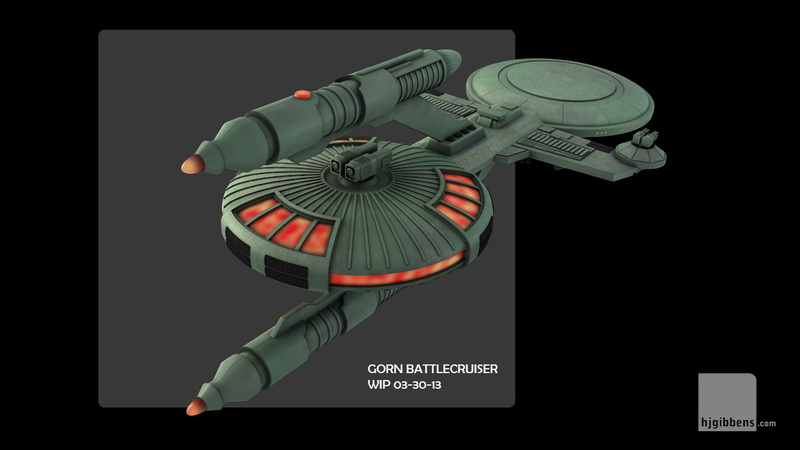 I like your completed version of the Gorn Warship. Excellent work as always. i wish I had a tenth of your talent! This looks really good. I've been quietly observing the progress of Ajax for a while now, (Since before they got the Exeter sets) and I have to say I'm impressed with every aspect of the production. Just a note. 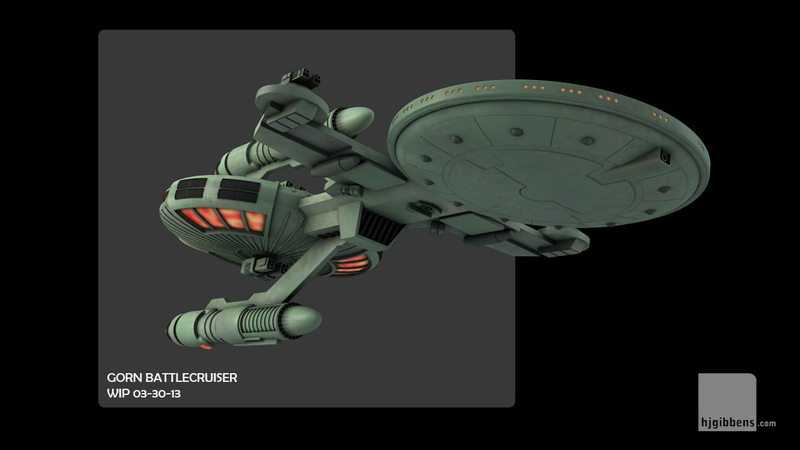 While the Enterprise looked grey blue, (because of the blue screen) I remember reading somewhere that the actual hull colour was very light grey with a hint of green.